April 2: Murphy will miss “at least” a month, manager Bud Black tells Jim Duquette of MLB Network Radio on SiriusXM (Twitter link). The Rockies are still awaiting an official second opinion on the injury. April 1: Murphy has indeed been placed on the IL, with Pat Valaika called up to take his spot on the active roster. The team announced the injury as an avulsion fracture. March 30, 10:00pm: There’s concern within the team that Murphy may have tendon or ligament damage, per Groke; if true, Murphy could miss “several weeks,” Groke writes (subscription required). 8:42pm: Rockies first baseman Daniel Murphy has suffered a fractured left index finger, Nick Groke of The Athletic tweets. Murphy will see a specialist Monday, but he’s likely on his way to the 10-day injured list. The 33-year-old Murphy incurred the injury Friday, marring a win over the Marlins and a 2-0 start for the Rockies. He sat out their loss to Miami on Saturday, when Ryan McMahon took the helm at first base. McMahon and Mark Reynolds could see the lion’s share of time at first as the Rockies await Murphy’s return. As of now, there’s no timetable for a comeback, per Thomas Harding of MLB.com. Murphy is just a couple games into his tenure with the Rockies, who signed him to a two-year, $24MM contract over the winter. It was otherwise a quiet offseason for Colorado, which is counting on Murphy – formerly of the Mets, Nationals and Cubs – to offer a significant upgrade at first. Rockies first basemen finished the 2018 season second to last in the majors in fWAR (minus-1.9) and hit a horrid .224/.295/.388, owing to poor performances from McMahon, now-center fielder Ian Desmond and Pat Valaika. Murphy batted a respectable .299/.336/.454 in 351 PAs, on the other hand, and has provided consistently above-average offensive production throughout his career. That has been especially true since a breakout showing with the Mets in the 2015 postseason. DECEMBER 21, 3:50pm: Colorado has announced the signing. 9:00am: Murphy’s deal with the Rockies is frontloaded and comes with some deferrals, per Rosenthal (Twitter link). He’ll earn $10MM in 2019 and $8MM in 2020. The buyout on the mutual option is valued at $12MM and comes with a $6MM buyout, though $3MM of that buyout payment is deferred. If Murphy unlocks any bonus in the standard awards bonus package that is included in his contract — All-Star, MVP, Silver Slugger, Gold Glove, LCS or World Series MVP — the buyout will increase to $7MM (with $4MM deferred). DECEMBER 20, 8:13pm: There’s also a mutual option for the 2021 season on the contract, tweets Robert Murray of The Athletic. 5:58pm: It’s a two-year, $24MM contract for Murphy, Jeff Passan of Yahoo Sports tweets. He’ll play mostly first base in Colorado, Passan adds. 5:46pm: Fancred’s Jon Heyman tweets that Murphy “is going” to the Rockies. 5:44pm: Murphy’s contract with the Rockies, if finalized, is expected to be a two-year contract, tweets Thomas Harding of MLB.com. 5:32pm: The Rockies are close to a deal with free-agent infielder Daniel Murphy, reports Ken Rosenthal of The Athletic (via Twitter). Patrick Saunders of the Denver Post connected the two sides yesterday in a mailbag column. Murphy is represented by ACES. Murphy, 33, will bring to the Rockies one of the game’s better left-handed bats. Presumably, he’ll be an option at both second base and first base in Colorado, helping to fill the void created by fellow free agent DJ LeMahieu. Murphy’s defense at second base has taken a turn for the worse recently, particularly following microfracture surgery on his knee last offseason, so it’s at least possible that the Rox view him more as a first base option than as a second base option. If that’s the case, then Ian Desmond would likely shift to the outfield alongside Charlie Blackmon and David Dahl. What hasn’t taken much of a downturn recently is Murphy’s bat. While the three-time All-Star and two-time Silver Slugger winner struggled a bit in his return from that aforementioned surgery, he caught fire after a brief slump. Over his final 293 plate appearances last season, Murphy flat-out raked at a .322/.358/.502 clip, swatting 12 homers and collecting 13 doubles along the way. He batted a combined .326/.375/.542 with 60 homers, 105 doubles and eight triples over the life of his previous three-year, $37.5MM contract, and he’ll take that production with him to the game’s most hitter-friendly environment: Coors Field. Suffice it to say, Murphy will deepen an already-excellent lineup featuring Nolan Arenado, Charlie Blackmon and Trevor Story. He’ll likely join that trio and David Dahl in comprising the top portion of manager Bud Black’s lineup next season, as the Rox look to build on their 2018 NLDS appearance and put together a strong roster in their final season of club control over Arenado. Given reports that Murphy’s primary position will be first base, it’s possible that general manager Jeff Bridich and his staff could yet explore the possibility of adding some additional second base options. However, between Desmond, Garrett Hampson, Ryan McMahon and Pat Valaika (to say nothing of looming top prospect Brendan Rodgers and some perhaps occasional work there for Murphy), the Rockies aren’t short on possibilities at the position. While first base isn’t a position that Murphy has played much in recent years, he does have experience there. Murphy, in fact, logged 850 innings as a first baseman as a back in 2009, in a season where he didn’t tally a single inning of second-base duty at the MLB level. His playing time there has been more sparse in the years to follow, though he did play 83 innings at first base in 2018 and 151 innings there in 2016. Murphy drew terrific marks at first in that ’09 season (+11 DRS, 5.9 UZR), though that obviously carries little weight when projecting his defensive capabilities as a first baseman a full decade later. His defense there since the 2015 season has generally graded out as average in a very limited sample, and, as the Rockies showed with their initial signing of Desmond, they’re not afraid to move an infielder off his more traditional position and play him at first. Murphy’s two-year, $24MM contract falls closely in line with the two-year, $20MM estimate forecast by MLBTR at the outset of free agency. As for the match with the Rockies, it was a relatively popular one among participants in MLBTR’s Free Agent Prediction contest, with roughly 6.6 percent of participants placing Murphy at Coors Field. 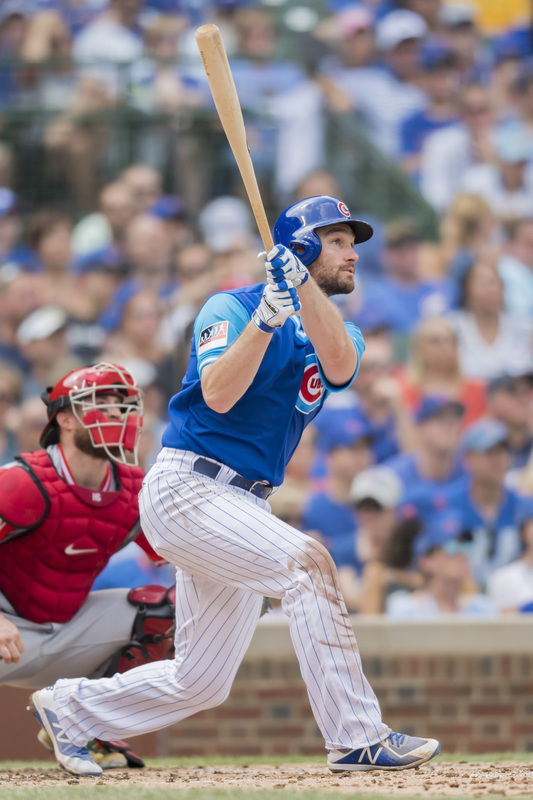 While Daniel Murphy was largely viewed as a rental when the Cubs acquired him, president of baseball operations Theo Epstein hasn’t closed the door on retaining the veteran infielder, writes MLB.com’s Carrie Muskat. “I wouldn’t rule anything out,” said Epstein. “He did a lot to right our offense right after he got here and contribute while being asked to play a bigger role than we envisioned when we got him because of injuries and because of a lack of performance offensively and because of the schedule.” Murphy stumbled out of the gates in 2018 upon returning to the from offseason knee surgery, but he hit .322/.358/.502 from July through season’s end — including a .297/.329/.471 slash after the Nats traded him to the Cubs. Addison Russell’s suspension has clouded the Cubs’ middle-infield picture, though Murphy’s defense at second base has graded out terribly over the past two seasons, which the Cubs will have to consider. It seems plausible that some clubs will prefer Murphy as a first baseman rather than a second baseman, though the Cubs have Anthony Rizzo locked in at first, so they’d have to be convinced he can play second base on a fairly regular basis. New Reds skipper David Bell discussed his approach to the position, as Bobby Nightengale of the Cincinnati Enquirer writes. He acknowledges being relatively new to the application of analytics to the field, but says he has “gone through a process the last five years of asking a lot of questions, understanding the information, understanding how to utilize it and how to factor it into all decisions.” That experience will surely help Bell in his current role, in which he says he’ll be open to incorporating all manner of information. Indeed, he indicated that he finds it “a very exciting time in baseball” with whole new approaches to deploying rosters percolating around the game. The Brewers undeniably had a successful 2018 campaign, but it occurred despite of the struggles of righty Chase Anderson, who inked a short-term extension at the end of the prior season. As Todd Rosiak of the Milwaukee Journal-Sentinel reports, Anderson wrapped up the current year saying he has plans to get back on track for 2019. GM David Stearns, meanwhile, says the organization expects the same. Anderson, who’ll soon turn 31, did finish with a solid 3.93 ERA in 158 innings. But ERA estimators including FIP (5.22), xFIP (4.79), and SIERA (4.68) were not impressed, and Anderson failed to sustain the slight but notable velocity bump from the season prior. Yesterday provided a notable turning point for the Nationals, who’ve struggled to build momentum all season long. The organization shipped out a pair of big lefty bats — Daniel Murphy to the Cubs and Matt Adams to the Cardinals — though it decided to keep another in Bryce Harper. While it’s still not impossible to imagine a late-season run, the organization obviously decided it would no longer forego cost savings and prospects in order to maximize its chances. Most of the above discussion is forward-looking, but there’s certainly cause and opportunity to look back at what went wrong. Injuries were unquestionably a factor, as Lerner noted in his letter, but that hardly explains the disappointment in full. Notably, the Nats have drastically underperformed their expected outcomes by measure of Pythagorean W/L and BaseRuns. Failing to capture wins is a complicated area to address, but the Nationals’ bullpen woes surely are a prime factor. Before yesterday’s roster reckoning, Chelsea Janes of the Washington Post documented the collapse of that unit over the course of the season. It’s a fascinating read that includes a detailed explication of the team’s decisionmaking and colorful accounts of the recent departures of Brandon Kintzler and Shawn Kelley. The piece is highly recommended, particularly for Nats fans. The Cubs have officially acquired veteran infielder Daniel Murphy from the Nationals, per announcements from both clubs. Prospect Andruw Monasterio is headed to D.C. in the deal, with the Nationals also sending an undisclosed amount of cash to Chicago. Murphy was claimed on revocable trade waivers, so the Nationals had the option of pulling him back or allowing the Cubs to take over his contract without receiving compensation. Instead, the sides worked out the cash to enable the Washington organization to acquire the young infielder. It is still not known precisely how the sides have divvied up Murphy’s remaining salary obligations. He’s earning $17.5MM on the season, with just under $4MM left to be paid. Having previously received a qualifying offer, Murphy would not have been eligible for one this winter from the Nationals. That surely helped convince the team to do the deal. Still, it’s perhaps a bit surprising that the club did not wait to see whether its fortunes might turn over the next week of play. Instead, the Nationals are more or less throwing in the towel on a disastrous 2018 season — in the sense, at least, that they aren’t valuing their prospects this year in assessing player transactions. While the club remains on the fringes of contention, it has failed to capitalize on several opportunities of late to make up ground. There’s still enough talent on the roster (and more still working back from the DL) that a late run can’t be ruled out entirely, but additional swaps could still further deplete the MLB talent pool and today’s deals unquestionably dent the Nats’ immediate outlook quite substantially. By moving Murphy now, the organization was able to acquire Monasterio, who Baseball America recently tabbed as an increasingly interesting young player. The 21-year-old Venezuelan has spent the season at the High-A level, where he carries a .263/.359/.336 slash with three home runs and ten steals — as well as an impressive combination of 52 walks and 64 strikeouts — over 436 plate appearances. Monasterio has mostly lined up at second base this year but has spent most of his prior professional time at shortstop. 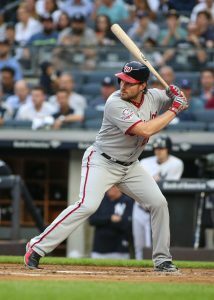 Murphy was among several high-priced Nationals players slated to reach the open market at season’s end, so this is likely a precursor to further dealmaking. Indeed, the club has already made a move on fellow left-handed slugger Matt Adams. Other pending free agents could also be moved, though superstar Bryce Harper will not be among them and there’s no indication that the team will move controllable assets. It’s certainly also an interesting strike from the Cubs’ perspective. Murphy is as polished a hitter as any in baseball, as the Chicago organization well knows from its memorable postseason encounters with him in recent seasons. He has bounced back from offseason knee surgery, and a slow start upon his mid-season return, to produce excellent results over the past six weeks. Since the start of July, Murphy carries a .336/.379/.893 slash with six home runs and an 11:11 K/BB ratio over 153 plate appearances. For a Cubs organization that has had some offensive issues of late, the lineup will get a big boost when Murphy is in it. Presumably, the club will play Murphy mostly at second base while utilizing Javier Baez quite frequently at short. Addison Russell will likely see his playing time cut back in that event, though in all likelihood he’ll still get time against lefties and in late-game situations when defense is a priority. Despite his increasingly compelling form at the plate, after all, Murphy has never been regarded as a quality defender or baserunner and has struggled quite a bit in both areas this year. Craig Mish of Sirius XM reported on Twitter that the Cubs had claimed Murphy and that a deal was being worked out. Robert Murray of The Athletic (via Twitter) reported that a deal was struck. Jon Heyman of Fancred (Twitter links) reported the return.